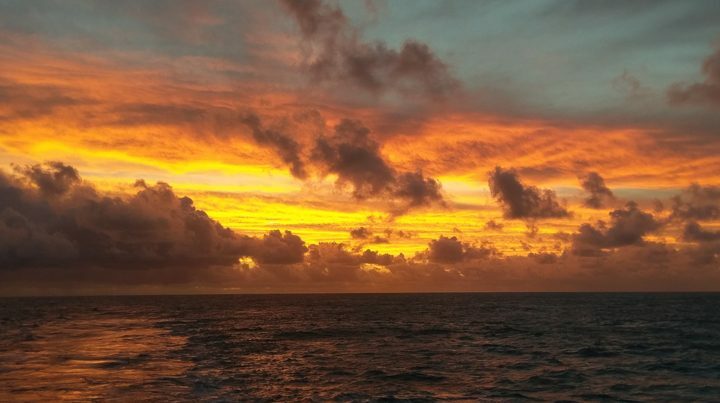 We have been traversing the South Pacific for over thirty days now. Early on, we had several days of high winds and rough seas with waves that may have been as big as 8 meters (over 25 feet). The bow of this gigantic vessel would sometimes submerge under a giant wave that sent thumps and reverberations throughout the hull of the ship. During those days, giant albatross followed the ship and showed off their flying skills. They would glide with great speed over the peaks of these waves and down into the troughs. At the bottom, they would make a sharp turn and catch the air current generated by the water motion and appeared as if they were surfing along the face of the wave. We’ve crossed several time zones and, for the first time in my life, I have experienced ‘boat lag’ and had to adjust my sleeping to compensate for the changes. It is difficult to distinguish one day from the other. Each morning I rise, have my coffee, and read the news via AP wire. After grabbing some breakfast, I prepare all of the filtration equipment in the lab. Next, I clean, adjust, and focus the FlowCam, an instrument used to image microscopic organisms in the water. Usually by the time that is completed we are on station (our daily stop to lower the instruments down deep into the ocean). We get suited up into our protective gear then go out on the back deck to deploy our instruments and pump sea water into large Nalgene containers with a spigot to dispense the water. 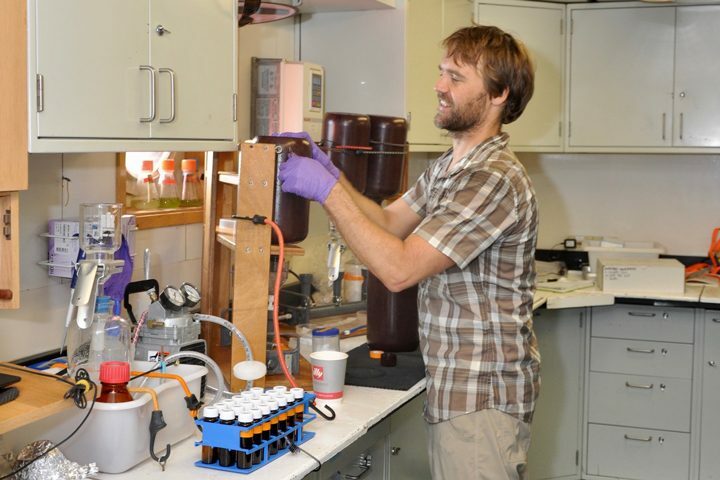 We bring the water samples into the lab and spend hours filtering the water through different types of filters. Back in the labs at NASA Goddard, we will analyze the particles that got trapped on the filters as well as what went through, or the dissolved portion. 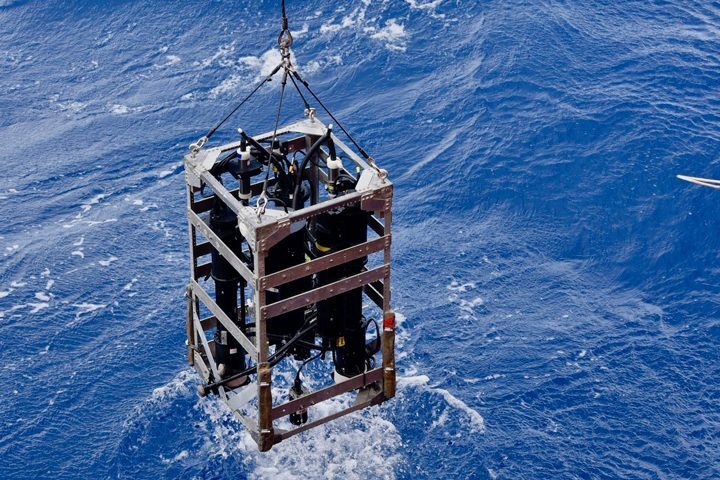 It’s all valuable information about the microscopic life in this part of the ocean and helps us understand the role each plays in Earth’s carbon cycle. The days here are long and repetitive. Sometimes I’m on my feet almost nonstop for 10-12 hours. When seas are rough, the boat is constantly moving and I have to compensate all the time for that movement while I stand, move, or walk. There are crew members, engineers, marine technicians, and scientists from many disciplines and institutions on this expedition. Everyone works hard and does their best to keep morale and spirits up. People organize cribbage and ping pong tournaments. 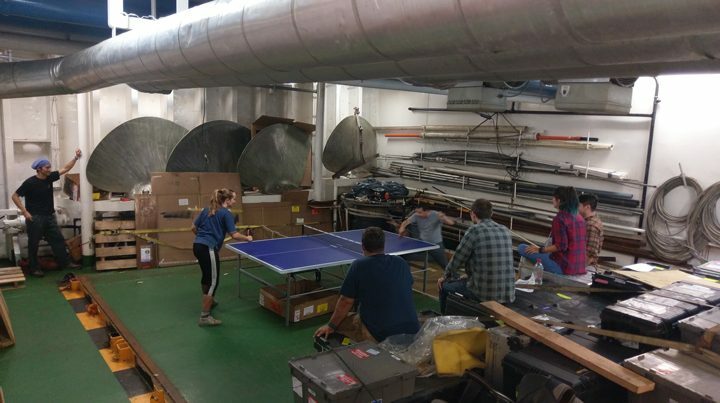 Sometimes it is hard to find the time where shifts and availability match up to compete, but it is a good way to have some fun if you can find some down time. On clear nights, I go out on deck where the stars can be so magnificent and I gaze deep into the universe. The Milky Way stretches across the sky from horizon to horizon. Since we are in the southern hemisphere, we see many constellations and celestial objects that people in the northern hemisphere cannot see. The Southern Cross is a very prominent constellation while the two Magellanic Clouds are neighboring galaxies that are an impressive sight, even with the naked eye. In the south, the image of the moon is inverted compared to viewing it from the north. The new crescent moon waxes, or increases size, from the left to right instead of the reverse direction that I’m used to seeing back home. 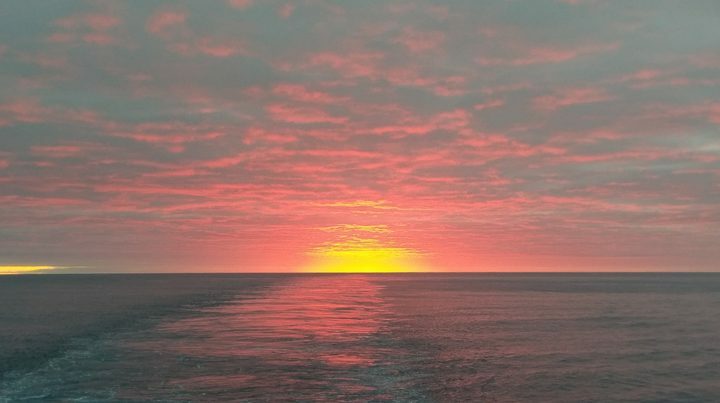 An unobstructed view of sunsets and sunrises over the ocean are an inspiration to see. Many of us try to meet out on the helipad after dinner to watch the sun dip below the horizon. When the clouds are positioned just right, it appears as if they become electrified and the sky lights up with brilliant reds and pinks. The reflection of the majestic show on the surrounding sea gives the whole effect a greater sense of awe. The ship ran out of vegetables and fruit several days ago and having a fresh garden salad is something I dream about. I miss my wife and my family. I miss our garden and our house. I miss feeling the damp earth under my feet and feeling the green grass between my toes. I miss the sounds of birds, insects, and animals scurrying through the forest. I miss going to concerts, museums, and making music with friends. There are many musicians on board, including myself. I try to sneak away for ten minutes here and there to strum my classical guitar and work on new and old songs. We get together and play sometimes as well. It is difficult to find a place that is quiet enough where we don’t disturb other people. However, we were lucky enough to have a jam session out on the bow on one afternoon when the wind and waves were fairly calm. Being surrounded by the sea with the sun on my face is a great inspiration for music! The boat has giant diesel engines and there is no way to escape their thunderous roar. The repetitive nature of this work is challenging. Every day I follow a similar schedule of working, eating, exercising, and sleeping. There are no days off and there is always more work to be done. Despite all the hardships of rocking on the seas for 40 days, I feel that our work has great meaning. For several decades, the science data collected on these repeat hydrographic research cruises has been analyzed and published in peer reviewed papers. The breadth of knowledge that comes out of this program and the previous ones that it is built upon contributes to understanding the bigger picture of how the ocean ecosystems are responding to the changing ocean and atmosphere. The work that we do here, and what other have done in the past, will help us to understand and mitigate the problems of future. It doesn’t take a lot of technology to see that the ocean is blue. And when it comes to the blueness of the ocean, it doesn’t get much more blue than where I am. I’m sitting on the research vessel Nathaniel B. Palmer—the largest icebreaker that supports the United States Antarctic Program—on an oceanographic expedition across the South Pacific Ocean, my current home, office, and laboratory. On this voyage, however, the Palmer has broken no ice. Our Global Ocean Ship-based Hydrographic Investigations Program (GO-SHIP) P06 campaign departed Sydney, Australia, on July 3, successfully ending the first leg of this journey on August 16 in Papeete, French Polynesia (Tahiti). This is where our team from NASA Goddard Space Flight Center (Scott Freeman, Michael Novak, and I) joined dozens of other scientists, graduate students, marine technicians, officers and crew members, for the second and final leg that will end in the port of Valparaiso, Chile, on September 30. 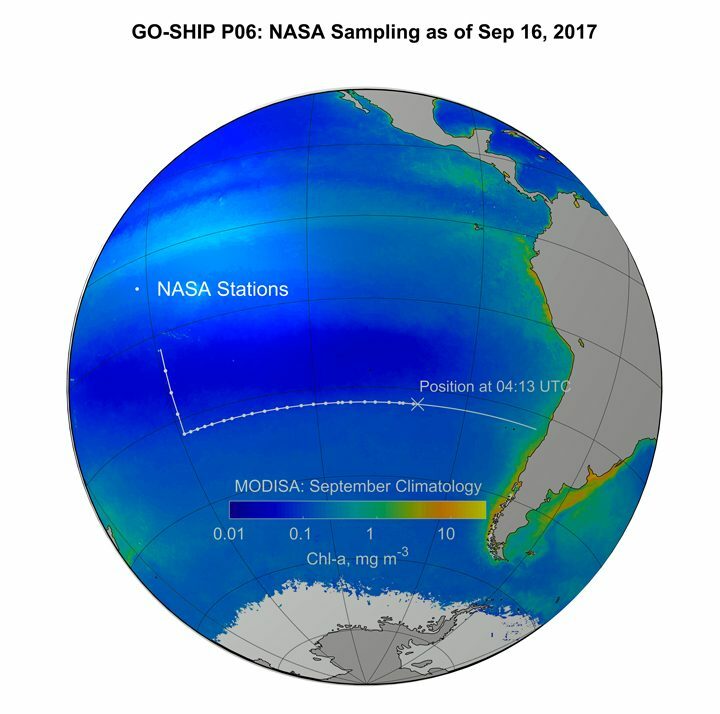 The GO-SHIP program is part of the long history of international programs that have criss-crossed the major ocean basins, gathering fundamental hydrographic data that support our ever-growing understanding of the global ocean and its role in regulating the Earth’s climate, and of the physical and chemical processes that determine the distribution and abundance of marine life. This latter topic regarding the ecology of the ocean is what brings our Goddard team along for the ride. The P06 ship track, for the most part, follows along 32.5° of latitude south. That route places our course just south of the center of the South Pacific Gyre—the largest of the five major oceanic gyres, which form part the global system of ocean circulation. The Gyre—on average—holds the clearest, bluest ocean waters of any other ocean basin. This blueness is the macroscopic expression of its dearth of ocean life. We have seen nary a fish nor other ships since we departed Tahiti—this is not a major shipping route. Oceanic gyres are often called the deserts of the sea. On land, desert landscapes are limited in their capacity to support life by the availability of water. Here, lack of water is not the issue. Water, however, is at least the co-conspirator in keeping life from flourishing. Physics, as it turns out, is what holds the key to this barren waterscape. This map (above) shows the MODIS chlorophyll climatology with the ship track superimposed. Due to the physics of fluids on a rotating sphere, such as our planet, the upper ocean currents slowly rotate counterclockwise around the edges of the center of the Gyre–as a proper Southern Hemisphere gyre should—and a fraction of that flow is deflected inward, towards its center. With water flowing towards the center from all directions, literally piling up and bulging the surface of the ocean–albeit, by just a few centimeters across thousands of miles–gravity pushes down on this pile of water. This relentless downward push puts a lock on life. The pioneers of life in the ocean, the tiny microscopic plants, known as phytoplankton, which drift in the currents, and grow on a steady mineral diet of carbon dioxide, nitrogen and phosphorus, and a dash of iron—and expel oxygen gas as a by-product, to the great benefit of life on Earth—must obtain most of their material sustenance from the ocean below. Layers of denser water trap the nitrogen and phosphorus-rich water at depth, keeping it too far down, where not enough light can reach it to spark the engine of photosynthesis that allows plants to grow. Why are we here and where does NASA come into this story? Since the late 1970s, NASA has pursued—experimentally at first, and now as a sustained program—measuring the color of the oceans from Earth-orbiting satellites as a means to quantify the abundance of microscopic plant life. Microbiology from space, in a way. Formally, though, we call it “ocean color remote sensing.” Whizzing by at altitudes of several hundred miles, atop of the atmosphere, bound to polar orbits that allow satellites to scan the entire surface of the globe every couple of days, carrying instrument payloads of meticulously engineered spectro-radiometers—cameras capable of measuring the quantity and quality, or color, of the light that reaches its sensors. This is where our work aboard the R/V Palmer comes into the story. The data the satellites beam down from orbit do not directly measure how much plant life there is in the ocean. Satellite instruments give us digital signals that relate to the amount of light that reached their sensors. 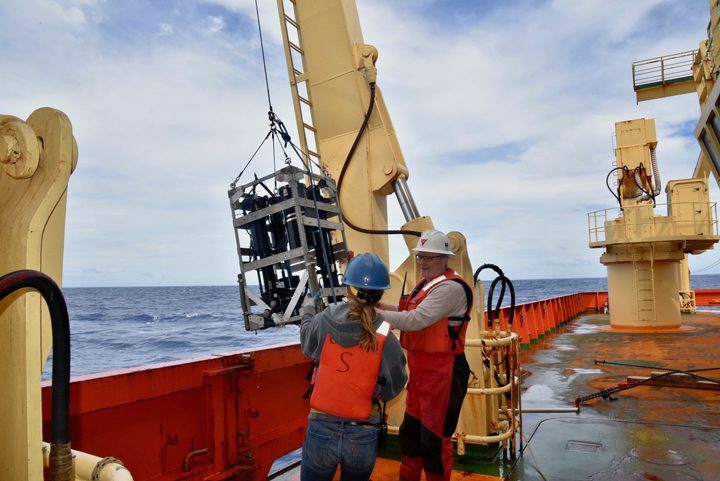 It is up to us to translate—to calibrate—those signals into meaningful, and accurate, measurements of plant life—or temperature, salinity, sediment load, sea level height, wind and sea surface roughness, or any other of the many environmental or geophysical variables satellite sensors can help us detect at the surface of the ocean. To properly calibrate a satellite sensor and validate its data products, we must obtain field measurements of the highest possible quality. That is what our team from NASA Goddard is here to do. Around midday, typically the time of the ocean color satellite flying over our location, we perform our measurements and collect samples. We measure the optical properties of the water with our instruments to compare what we see from the R/V Palmer to what the satellites measure from their orbit above Earth’s atmosphere. At the same time that we perform our battery of optical measurements, we also collect phytoplankton samples to estimate their abundance, species composition as well as the concentration of chlorophyll-a, the green pigment common to most photosynthesizing organisms like plants, including phytoplankton. By collecting these two types of measurements at once, light and microscopic plant abundance, we are able to build the mathematical relationships that make the validation of the satellite data products possible. 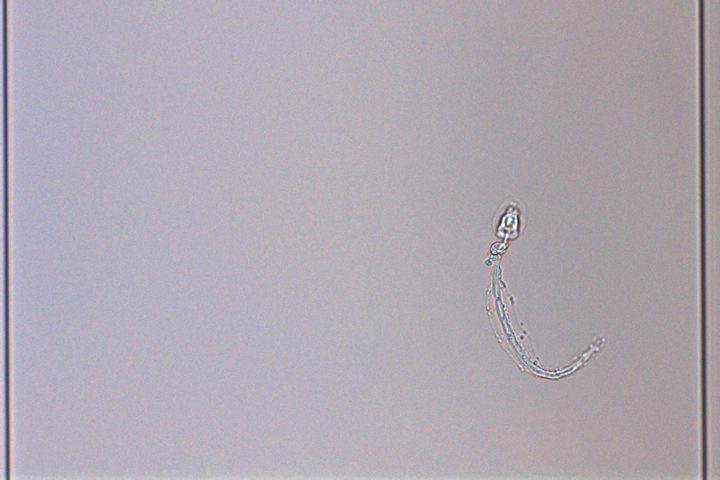 The waters of the South Pacific Gyre are an ideal location for gathering validation quality data, perhaps one the most desirable to do so, because there are few complicating factors and sources of uncertainty that blur the connection we want to establish between the color of the water and phytoplankton life abundance. Our measurements will extend NASA’s ocean chlorophyll-a dataset to some of the lowest values on Earth. The water here is blue; in fact, it’s the bluest ocean water on Earth.